Light rail is taking Canberra on the fast track to urban densification. File photo. It’s official: Canberra is getting light rail because it facilitates urban renewal. Thus spake the government at last year’s inquiry into Phase 2 to Woden. In fact, the government has been saying this since 2013, when its own report on the case for light rail pointed out that a modern bus transit system could meet all public transport objectives just as well for half the price. The report advised the government to promote light rail as facilitating urban renewal in a way buses could not. This was to be the tie-breaker between buses and trams. But will the current light rail project optimally deliver on those goals? Light rail carries more people more comfortably and more quickly than standard buses. It is, however, much more costly. Consequently, it is best introduced where there are already centres of people concentration like universities, colleges, hospitals, stadia, cinemas, restaurants, shops and large employers. Only there will light rail encourage people out of cars, reduce congestion and speed up public transport travel times. But Gungahlin has no major employer and its retail centre is relatively small. Nor are there any universities, hospitals or large schools along the route. Mitchell never hosts masses of people and the racecourse and EPIC only occasionally. There are already people in apartments and hotels along Northbourne Avenue but one would hardly build light rail for them alone. Or rather, the route does not yet have the required concentration. The government believes this can be retrofitted: massive densification will create the throngs light rail needs to be cost-effective. In addition, these masses will bring ‘life’, in particular, commercial life, to the route. They will encourage businesses to set up shop there, which will, in turn, draw people as customers and patrons to the route, thereby making light rail even more cost-effective. Property values will go up, thereby increasing rates, and thriving businesses can be harvested for revenue. Perhaps, too, more of this extra value can be captured by imposing special levies for the privilege of living or setting up shop on the route. Light rail will facilitate urban renewal and urban renewal will facilitate light rail. But will densification create the concentration of people light rail needs while allowing it to make the best possible contribution to public transport across all of Canberra? Will densification create this concentration without undermining the quality of the urban renewal light rail is supposed to create? The 37,000 people the government plans to pack along the route will not want to travel only to destinations on the route. So unless these people have an integrated bus system that permits them to move quickly and efficiently to and from other destinations, they will be using cars a lot, possibly even most of the time. This will create congestion and reduce the quality of the ‘life’ created by light rail. A well-integrated bus service with frequencies equal to the tram is thus essential to making the best possible contribution to public transport and urban renewal. Yet densification makes it harder to achieve such a bus system. The residential concentration of people around the tram generates a low-intensity stream of diverse transport needs across the entire day which the tram will not meet. Creating the numbers needed for light rail through densification will thus increase the task for buses even as light rail takes resources away from them. Congestion around the tram line will be greater, the quality of urban renewal lower and public transport’s challenge to the car will be weaker than they could be. 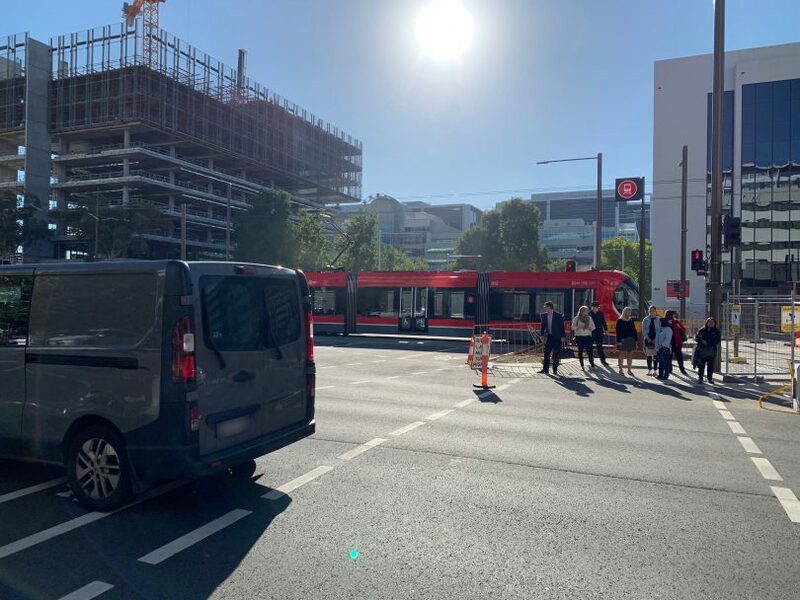 The way Canberra is introducing light rail—building it on a route with insufficient numbers, then retrofitting the numbers through densification—is inefficient. Indeed, it is grossly inefficient. Canberra already has a route with the required centres of people concentration on or near it: Belconnen via Civic to Woden, linking Belconnen Mall, the ABS, a new hospital, University of Canberra, Radford College, Bruce Stadium, Calvary Hospital, the ANU, Civic, the Parliamentary Triangle and Woden Town Centre. This route does present more engineering difficulties, but if these difficulties rule this route out, then they rule light rail out since no other route is more suitable. Better then to improve the bus system massively and wait until its success made an upgrade to light rail or some other technology more viable. So why has the government embarked on the current light rail project? It wants the revenues it believes densification will bring. Andrew Barr has traded the best possible improvement of public transport and the quality of urban renewal for this pot of gold. Bruin Christensen is a philosopher in the School of Philosophy at the Australian National University and writes extensively on a number of subjects. Visit his website for more details. Can anyone send me a link to the business case that the govt relied on to justify the LR? I want to make an informed decision on LR's merits before I comment. Darryl Parker google works well for this kind of thing. But anyway. Anyone who has lived in or visited Melbourne knows that the tram routes are also host to large numbers of cars, because that commercial life along the route that is so desired by LR advocates is also desired by people who can only get to it by car, and those people far outnumber those that live along the route. Park and ride has never worked to the level required to turn the fantasy into a reality. Regardless of alternative transport options available the number of cars on the roads will continue to increase year on year, until cars themselves are transformed, e.g. become fully autonomous etc. The simple reality is that, for most people, the alternatives are just not practical. It’s not a matter of applying more persuasion. You can apply congestion taxes but that just turns the precincts into exclusive access areas where the majority of the infrastructure is paid for by those who can’t conveniently access it. There is lots of criticism of this current government but the alternative government is invisible on these issues. Actually the number of younger people purchasing motor vehicles has dropped in recent years, particularly in cities (which is where most people live) so this is more of a generational thing probably. A lot of the baby boom generation are wedded to the PMV so won’t use any other form of transport. However for millenials the attraction is not quite as strong. I don’t know where you got that information from but the evidence in Canberra is that almost every family member (including young people) has a car and with that comes the problem of where to park it at home. I have a friend who lives at Gungahlin who lives at the end of a cul-de-sac which has cars parked along its entire left so that every time I visit him I have to park in another street about 300 metres away. This was not always the case. I don’t know why you single out baby-boomers as a problem but it would be impossible for most of us to use busses (public transport) to do the things we have to do. You must have a very restrictive lifestyle if you haven’t got a car. I wasn’t singling out b-boomers in particular, just observing a social change. If you like driving everywhere, no one is stopping you from continuing to do so. However there are other ways of getting around and sometimes it doesn’t hurt to broaden one’s mind a little and give it a go (cycling, walking, bus, light rail, heavy rail etc.) There are may routes in Canberra where a car is not needed, including major travel destinations: City to Woden, Belconnen to City, Gungahlin to City, etc etc. Also local trips which can be walked or cycled. The Barr government has not provided any evidence that the urban renewal benefits of light rail are higher than a segregated busway. As a consequence it has probably spent hundreds of millions unecessarily on the Civic to Gungahlin light rail. It now is wanting to extend light rail to Woden in the absence of a business case. A responsible and competent government would do the analysis to determine the most appropriate land use transport strategy for the Civic to Woden intertown public transport route. The Woden to City route (Stage 2) is currently being planned. There has been extensive media around this stage, parliamentary committees public surveys and consultation. The urban renewal benefits of light rail are in evidence around Australia (and overseas). Obviously some people will not accept this type of transport whatever a government does (Labor or Liberal). So if they want to continue exclusively using a private motor vehicle then they are entitled to do so. Other people are entitled to use multi-modal transport. Are there park and ride areas along the way? I'd catch it if so. But I'm not moving to an apartment on Northbourne Ave.
Sacha Blumen says at one stage Canberra was all sheep farms and maybe we should go back to that. In fact AQIS still class Canberra as a “rural destination” and it is not unusual to see sheep grazing adjacent to industrial developments in suburbs like Hume. Then there are the other “sheep” who support the current government every election. Why does Canberra have to expand at all? There is a simple logic gap in Bruin’s analysis which is astounding. The tram allows people to leapfrog all of the things in the middle, i.e. it is going to allow people who live in Gungahlin (also surprisingly missing from the diatribe, which the tram line apparently ends in Mitchell according to Bruin) to go straight past EPIC and the racecourse and go to civic while picking up a few more residents that live along Northbourne. Sounds like the school of philosophy has been attacked by a case of right-wing-itis. For much of its life, this Government has been going around in ever-diminishing(ly credible) circles about building standards in this town – particularly the standards (ahem) of the high-rise dwellings which are integral to densification. If the Government could, at long last, sort that out, and maybe, bridge at least part of the gap between the current dreary reality of local design standards and the Chelsea – Tribeca/Manhattan – Bloomsbury – Copenhagen etc. etc. etc. fantasies which many Canberrans apparently entertain, they might have a better chance of success with densification (and the related revenue ambitions). Margaret Brauer so you would rather the city continue to expand outwards? > Just wait until our Show ground and horse racing track are given to developers to build more termite mounds. Have just read in the Folk Festival’s program that there’s going to be paid parking at EPIC next year. Wouldn’t be to make events like Summernats, the Folkie and the Farmer’s Markets less popular, would it? Parking charges are usually applied by the event that is using EPIC. And indeed if you look at the fold festivals own website on the matter you will find the quote below. So no paying for parking at this even is not some grand conspiracy theory to turn the land into housing. How long will it take for people to realise they shouldn’t mindlessly vote labor? Only Charles Darwin could make an educated guess at that. The anti-Barr sentiment is illogical. The reason Canberra is growing is that Australia is growing – Canberra is the national capital, hence Canberra grows. More people needing to be housed hence greater density of housing needed. Then more comprehensive public transport network needed. Hence the staged light rail project. (Other growing cities and regions like Newcastle and the Gold Coast are doing the same -and Andrew Barr isn’t their Chief Minister). So a little bit more realistic thinking needed here, not the ‘let’s blame the Labor Chief Minister’ and assorted hand wringing and foot stamping. Discussion around routes and roll-out schedules is useful. Obviously the Belconnen area will be an important part of the network. All in all a multi-modal transport system is an inevitable consequence of a growing city. At this stage if one still wanted a little bush village atmosphere, then there’s always Bungendore, Braidwood, Collector etc. The growth is artificial coming mainly from migration. The Chief Minister has made the decision that Canberra should be plugged into this pyramid scheme without ever explaining why it is necessary for Canberra to be a part of it. He is supported by developers and big business which is the worst possible way to distribute any perceived wealth that is generated. I call it “profitless prosperity” and unless substantial levies are imposed on all future growth to create a sinking fund for future head-works and infrastructure (water supply and sewerage treatment for example) the additional burden on ratepayers will untenable. Whatever way you look at it it is unsustainable and the consequences will be far reaching. I don’t think the growth in canberra is “artificial” if one is getting a job and a home from that growth. For people getting jobs and homes it is as real as the post-war baby boom growth. The Newcastle light rail was found by the NSW Auditor general to be a huge waste of money. The Gold Coast light rail received hundreds of millions of dollars in funding from the Federal government. The Sydney CBD light rail has been a financial disaster. A busway would deliver similar transport and city development benefits. We the Canberra community are paying high prices for Labor and Green politicians to play with a shiny red train set. “A shiny red train set”. Perhaps they should be playing with shiny red SUVs instead? The point is that it isn’t just Andrew Barr as Chief Minister responsible for the trend towards light rail in cities and regional centres,, (such as the Gold Coast and Newcastle.) There appears to be a new-found adoration of buses from a number of people who rarely use them. It is inevitable that more than one transport mode will be developed as cities and regional centres grow. Of course Newcastle was a waste. They should have simply kept the railway line right where it was rather than cutting it short and doing the rest with light rail and developing the railway land. Whilst it is positive to have the river foreshore opened up it would have been better to lower the train line, coming up near Newcastle station. Just wait until our Show ground and horse racing track are given to developers to build more termite mounds. David Brown the horse racking track cannot be given away because the government doesn’t own it. The Canberra racing club does. They also own the strip of land between the light rail track and the race course. I would bet that they (the racing club) might rezone and develop that bit of land, which is not such a bad thing. Ashley Wright Thanks. I did not know that. But I remain confident that Barr will have his eyes on the Show Ground. 3) Belconnen is a future stage. Stop taking like civic to gungahlin is the first and only. Sacha Blumen I suggest that you move to a city that suits you rather than wreck my garden city. "Densification" - where's my fainting couch? Is it time to say goodbye to the bush capital?